Spectators at the English Premier League match between Tottenham and West Ham at White Hart Lane on October 6. (CNN) -- Faced with the threat of arrest, fans of an English soccer club defied police Sunday by chanting an anti-Semitic term which they claim to have appropriated in a positive manner. A section of Tottenham Hotspur supporters chanted "Yid Army" and "We'll sing what we want" at the home Premier League match against London rival West Ham -- a fixture which last season saw one of the visiting fans banned for life for performing a Nazi-style salute. Just one man was arrested this time, the UK Press Association reported, as he was taken aside by police at halftime and held on suspicion of committing a public order offense in the East Stand at White Hart Lane. 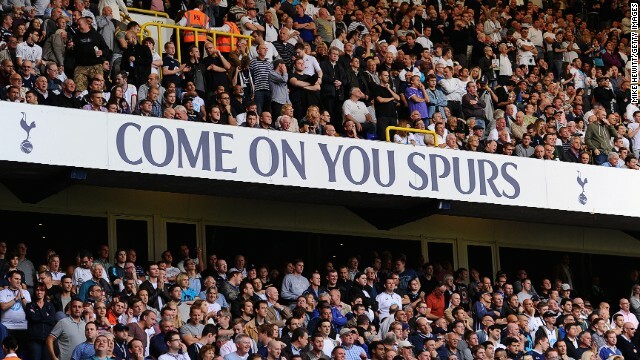 Spurs fans greeted their players' entrance onto the pitch with their customary "Yiddo" greeting, PA reported, and sang "Jermain Defoe, he's a Yiddo" for the club's former West Ham striker. While last season some West Ham fans chanted "Adolf Hitler is coming for you" and mimicked the sound of gas chambers, this time they responded to the call of "Yids" with humor, replying with "Racists! Racists" according to PA.
Tottenham's fanbase has a large Jewish contingent, and they originally called themselves "Yid Army" in response to anti-Semitic abuse from rival supporters. However, the use of sensitive words has sparked intense debate -- police said before the match they would arrest any offenders, but British Prime Minister David Cameron defended the Tottenham fans' chanting. "There's a difference between Spurs fans self-describing themselves as Yids and someone calling someone a Yid as an insult," Cameron told the UK-based Jewish Chronicle newspaper. "You have to be motivated by hate. Hate speech should be prosecuted -- but only when it's motivated by hate." But Cameron's views have been dismissed as "ludicrous" by Race for Sport, a group which prides itself on "promoting fairness, justice and equality within all sports." David Neita, a spokesperson for the group and a member of the Society of Black Lawyers, says the attempt by Tottenham fans to suggest they have reclaimed the word "is an insult to anybody's intelligence." While Tottenham's fans may have seemingly won this battle with the police, on the pitch the club's title hopes were hit by a 3-0 defeat -- Spurs' first home reverse this season. New Zealand international defender Winston Reid scored the Hammers' first away goal of the 2013-14 campaign before Ricardo Vaz Te and Ravel Morrison, with a solo breakaway, moved their club out of the bottom three. Tottenham dropped to sixth place, three points adrift of north London rival Arsenal -- which returned to the top on goal difference above Liverpool after being held 1-1 by West Brom. Claudio Yacob headed a first-half opener, but Jack Wilshere -- criticized in midweek by manager Arsene Wenger after being seen smoking outside a nightclub -- rescued Arsenal with a deflected 63rd-minute equalizer. Chelsea, the fourth London club in action Sunday, claimed third place with a 3-1 victory at Norwich thanks to late goals from substitutes Eden Hazard and Willian. Oscar had put the Blues ahead in the fourth minute after combining with striker Demba Ba, but Anthony Pilkington gave Norwich hope with a second-half equalizer. Southampton moved into the top four after a 2-0 win at home to Swansea, with a goal in either half from winger Adam Lallana and substitute Jay Rodriguez.